The Philippines has once more regained its pride on the recent World Cup of Pool Championship 2009 held here in the country last September 6. 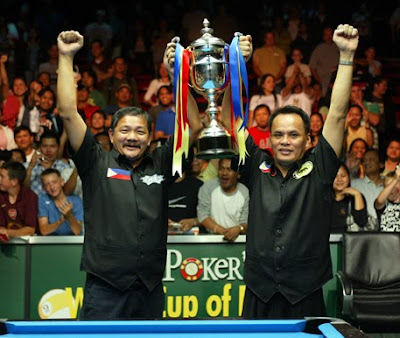 And of course, it is because of our billiards virtuoso tandem Efren "Bata" Reyes and Francisco "Django" Bustamante. The two battled against two German champions Ralf Souquet and Thorsten Hohmann on a score of 11-9. I thought Reyes will no longer appear on the limelight because it has been years since we heard victory from him. I wonder if he changed his pool cue and found a lucky one that really fits his arm length and fingers like those cool and hot cue designs available at PoolDawg. I fancy those pool cues because they have these personalized art drawings that as enthusiast, would consider them as collectors' items. You will also see on the page many other items related to pool like cue cases and shafts. According to most pool players that I heard on interviews, they say that a great percentage of their performance on game relies on the pool cues that they will be using. Most of them would prefer the one that they got used to because they have adapted to its comfort as they claim.